When you take a look at the Bruce Trail map one of the common misconceptions is quickly dispelled. The Bruce Trail spans much more than just Bruce county; although some of the more famous sections are found along the Bruce Peninsula. Whether you are planning on hiking the whole thing, or just looking to hike a portion for the day, the Bruce Trail offers an amazing perspective of not only Georgian Bay but south central Ontario. 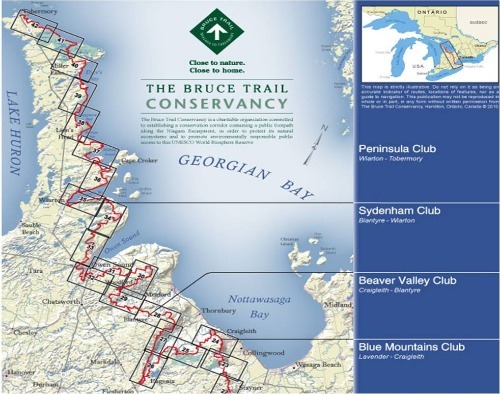 The above map only shows the portion of the Bruce Trail that is found throughout Ontario cottage country. It gives you an idea of the general route hugging the coastline along the Bruce Peninsula and more inland after Wiarton and Owen Sound. 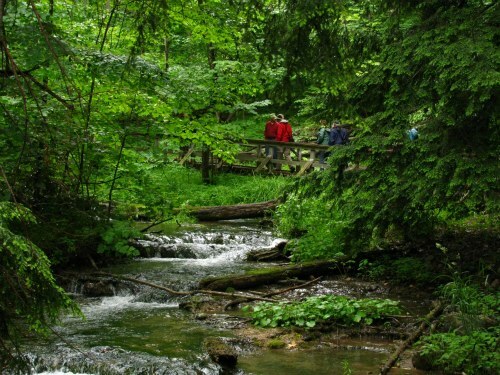 If you are serious about hiking the trail you need to visit the official Bruce trail organization known as the Bruce Trail Conservancy. Their website offers detailed and interactive maps of the entire Bruce Trail. Many of the cottage country towns we like to visit are found along the trail like Tobermory, Wiarton and Lions Head. And while there are many hidden wonders along the trail one of the more popular spots is the Grotto at Cyprus Lake. From Tobermory to Queenston near Niagara Falls, there is over 800 km of the main Bruce trail and it could take you 30 days to hike it all if you were up for hiking 8 hours a day until you finished. But if you are like me you will take your time to explore this special spot in Ontario. Return HOME from Bruce Trail Map.